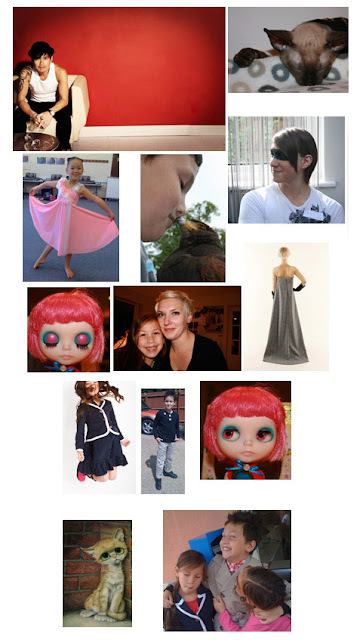 So please enjoy my personal mood board of inspiration for 2010. 1. My hubby, the amazing Yan To - having just launched his first womenswear collection he will be showing at On/Off in Feb.
2. My new kitty Cheryl... she is a super oft Cornish Rex and my new baby! Did you know that she has her own kitty blog at TotallyKitty? 3. FunnyGirl.. the funniest kid in my life - she brings light and joy to every path she meets. 4. TotallySonny, my no2 son - a geeky scorpio blogger just like me! 5. No1 son.... now off at uni and who would have guessed that he would be planning a career in the media too? 6. My new addiction, Blythe. The amazing doll who was originally produced for just one year in 1972 ( the year I was born). Alas she was ahead of her time. I love her style and in all honesty she's as photogenic as ModelGirl! 7. My no1 daughter - ModelGirl (in pic with me). She inspires me and challenges me in equal measure. I love her with all my heart after longing for a daughter for so many years. 8. The dress... I love this dress. My hubby made it for me and it makes me look and feel like a total princess. 9. ModelGirl in her full modelling glory. She has the ability to be totally amazing. 10. TotallySonny was so excited by my blog that he started blogging himself. Amazing for an eight year old boy. 11. My beautiful custom Blythe once again... this one is for RosieScribble. 12. My other new addiction... Big Eye Art. I have loads of pics and if you ever see any at car boot sales or thrift sales, please buy them for me! This is my fav... and why wouldn't it be? Those big sad eyes are so me! Great pics & a great way to highlight your year. My resolution for this year is to take more pictures, especially of my children. They seem to be growing up so fast now. I am a 1972 Scorpio too! Juicytots... do we rock or what?! Blythe, Tripp Trapp.... vintage we are ! Wow, your mood board is cool! If I did one for me it would be quite worryingly dark...! Wow! Way to go Blythe sister! This is brilliant. I love all the photos but possibly the Blythe doll a tiny bit more than the rest. You're a star! I told @tara_cain pink hair was in!